Edward picks up what he thinks is a rock. He doesn’t know it is a sleeping Time Fetch—and touching it will release its foragers too soon and alter the entire fabric of time and space. Soon the bell rings to end class just as it has begun. Buses race down streets, too far behind schedule to stop for passengers. Buildings and sidewalks begin to disappear as the whole fabric of the universe starts to unravel. To try to stop the foragers, Edward must depend on the help of his classmates Feenix, Danton, and Brigit—whether he likes it or not. They all have touched the Fetch, and it has drawn them together in a strange and thrilling adventure. The boundaries between worlds and dimensions are blurred, and places and creatures on the other side are much like the ones they’ve always known—but slightly twisted, a little darker, and much more dangerous. 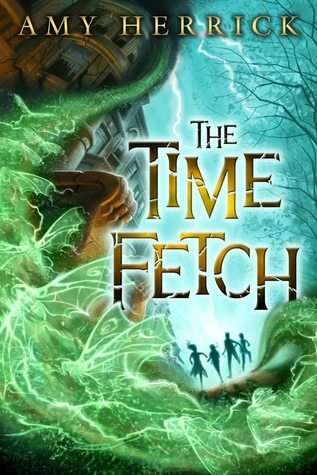 A fast-paced tale filled with mythology, danger, friendship, and a shocking centuries-old secret, The Time Fetch is sure to delight fans of fantasy adventure with its tale of ordinary kids who tumble into a magical situation. Amy Herrick is the critically acclaimed author of At the Sign of the Naked Waiter and The Happiness Code. The Time Fetch, due out August 27, 2013, is her first book for young readers. Amy lives in Brooklyn, New York. Every morning, she and her dog take a long walk in Prospect Park looking for adventure. They’ve seen and heard many wondrous things there, some of which have served as inspiration for The Time Fetch. So, our protagonist, Edward, is an orphan living with his quirky Aunt Kit. He is a loner in a defiant way, by choice, and fascinated by the interaction of science and the material world. Despite his Aunt's constant warnings (or perhaps because of them), Edward holds little belief in the mystical and magical side of life. This attitude soon changes for Edward after he picks up what he believes to be a random rock for a science class that turns out to be a microcosm of time management for the universe, a Fetch. The mechanics and magic of a Fetch are intricate, but suffice it to say that Edward toting this Fetch around is a very, very bad idea. Anyway, by having moved the Fetch, Edward has messed up the whole delicate system. The Foragers are loose in the world gobbling up time in ever-increasing quantities. That would be well and good if they would just keep eating the whole hour of history class or time spent in the DMV line, however, the Foragers aren't particular and chaos ensues. Edward discovers that he needs to save the world and three of his classmates are thrust in this quest with him due to the fact that they have all touched the Fetch and it is affecting them in various ways. This gang is an unlikely grouping because they aren't normally friends in school and a couple (Edward and Feenix) are outright enemies. The characters could fall into Breakfast Club stereotypes (jock, loner, jerk, mean girl), but in Herrick's hands, each character becomes more interesting (as do those in The Breakfast Club, just saying), so you are happy to go on this adventure with them. Although The Time Fetch is absolutely a stand-alone novel, I do see promise in it becoming a series. The characters are well thought-out, the pace is brisk and the world-building is fantastic. I have been on quite a MG kick this summer and The Time Fetch is one of the best I've read so far this year. Algonquin Books has been kind enough to provide FOUR copies of The Time Fetch for four lucky Steph's Stackers to enjoy. The odds are ever in your favor, so enter now! They are welcome to steal that time when I'm sitting in the examing room at the doctor's office in that little paper gown waiting on the doctor to come in a take a look-see. Thanks for the Chance to win this awesome looking book. They can certainly steal all the time when something goes wrong in my life!